London, June 10 -- With the departure of King Alfonso , interest in society circles begins to center on the coming wedding of Prince Gustaf Adolf , eldest son of Crown Prince Gustaf of Sweden and Norway, and Princess Margaret Victoria , daughter of the Duke of Connaught, to which unusual attention is drawn by the present crisis between Norway and Sweden . The wedding dress is a cloud of pure white Irish lace, posed over white satin and strewn with garlands of orange blossoms and myrtles. The corsage is cut low, and there is the regulation court train. This is a confection from Paris, but practically all other dresses for the bride and bridesmaids are of British or Irish make and material. The Duke and Duchess of Connaught gave a garden party at Clarence House yesterday for the display of the magnificent wedding gifts, which formed an amazing display of jewelry, especially rubies, Princess Margaret Victoria's favorite gem. 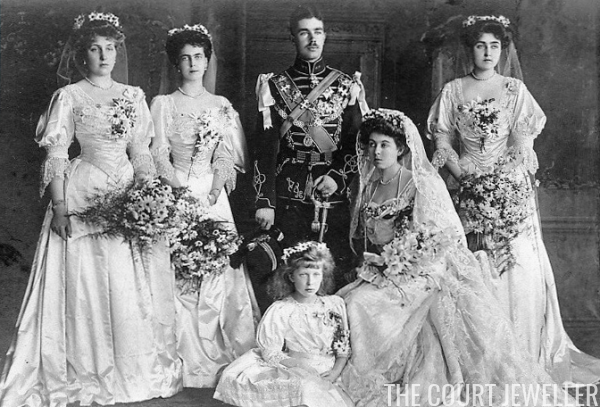 The Duke and Duchess of Connaught gave their daughter a diamond tiara  and a sable coat. King Edward and Queen Alexandra gave a magnificent tiara of rubies and diamonds , while a beautiful necklace of rubies and diamonds  is the joint gift of the Prince and Princess of Wales, Princess Louise and the Duke of Fife, Princess Victoria, and Prince and Princess Charles of Denmark . The Khedive of Egypt sent a diamond tiara . 1. King Alfonso XIII of Spain (1886-1941) made a state visit to the UK in June 1905, just before this article was published. He was hosted at Buckingham Palace by King Edward VII. Royal matchmakers had hoped that the young Spanish king would catch the eye of Princess Patricia of Connaught, one of Edward VII's nieces (and one of the most eligible princesses in the country). Instead, Alfonso met Princess Ena of Battenberg, another of the British king's nieces. Alfonso and Ena married the following year. 2. Gustaf Adolf of Sweden (1882-1973), the grandson of King Oscar II of Sweden. Gustaf Adolf was the son of Crown Prince Gustaf of Sweden and his wife, Victoria of Baden. He ascended to the throne as King Gustaf VI Adolf of Sweden in 1950. Just like Alfonso, Gustaf Adolf had originally been targeted as a bride for Princess Patricia; instead, he fell in love with her elder sister, Princess Margaret. 3. Margaret of Connaught (1882-1920) was the elder daughter of the Duke and Duchess of Connaught (and therefore a granddaughter of Queen Victoria). She married Sweden's future king in 1905, and two years later, she became the country's crown princess. While heavily pregnant with her sixth child, Margaret died in 1920 of an infection following an operation. Today, two of her grandchildren are reigning European monarchs: King Carl XVI Gustaf of Sweden and Queen Margarethe II of Denmark. 4. In June 1905, Sweden and Norway were a part of a personal union of countries under a single monarch (King Oscar II of Sweden and Norway). In August 1905, the people of Norway voted almost unanimously to dissolve the union and become a fully independent nation. The Norwegians initially offered to let one of Oscar II's younger sons become their new monarch; the diplomatic move was called the "Bernadotte offer." After the offer was rejected, Norway's parliament ultimately selected Prince Carl, a younger son of Denmark's king, as their new monarch. Carl was married to Princess Maud of Wales, a daughter of King Edward VII of the United Kingdom. They were crowned King Haakon VII and Queen Maud of Norway in June 1906. 5. 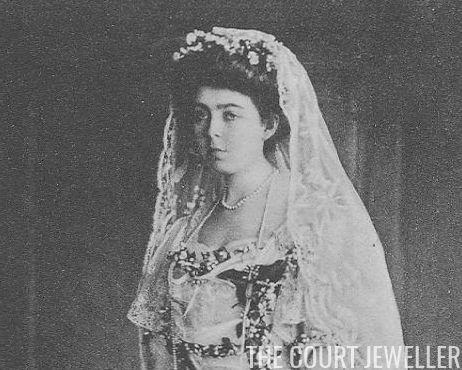 The Connaught Diamond Tiara, a wedding gift from Margaret's parents, was made by E. Wolff and Co. in 1904; today, the tiara is owned by Margaret's grandson, King Carl XVI Gustaf of Sweden. 6. 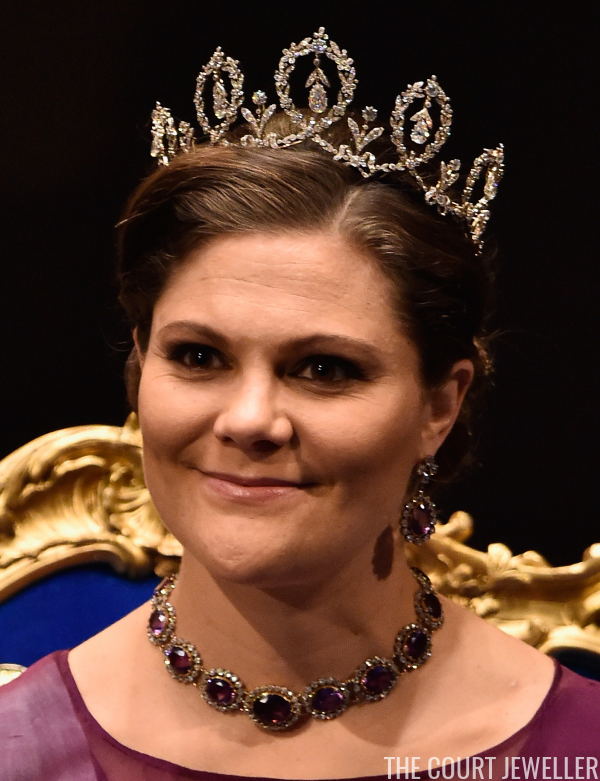 The King Edward VII Ruby Tiara, Margaret's wedding gift from her uncle and aunt, is owned today by her grandson, King Carl XVI Gustaf of Sweden, but there were several controversial sales of the piece within the family during the twentieth century. 7. This necklace of rubies and diamonds was made to coordinate with the King Edward VII Ruby Tiara. It was sold, and its whereabouts are not known. 8. The necklace was a gift from the children of King Edward VII and Queen Alexandra and their spouses. The Prince and Princess of Wales were the future King George V and Queen Mary of the United Kingdom; Prince and Princess Charles of Denmark were the future King Haakon VII and Queen Maud of Norway (see note #4). 9. The Khedive of Egypt gave Margaret a magnificent diamond tiara from Cartier; the gift was especially significant because Gustaf Adolf and Margaret fell in love and became engaged in Egypt. 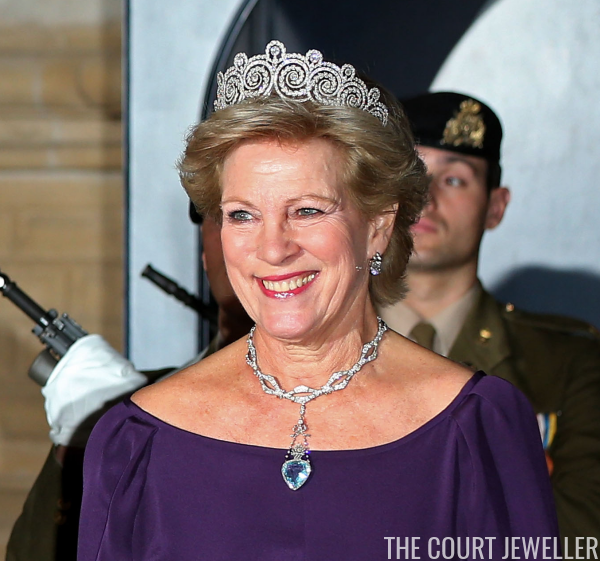 Today, the tiara is owned by Margaret's granddaughter, Anne-Marie, the former Queen of Greece. It has become the official wedding tiara of all of Margaret's female-line descendants.